As you can see, algae produces a lot more oil per acre than all the other oil crops put together. And this is why algae biodiesel is gaining more and more interest. 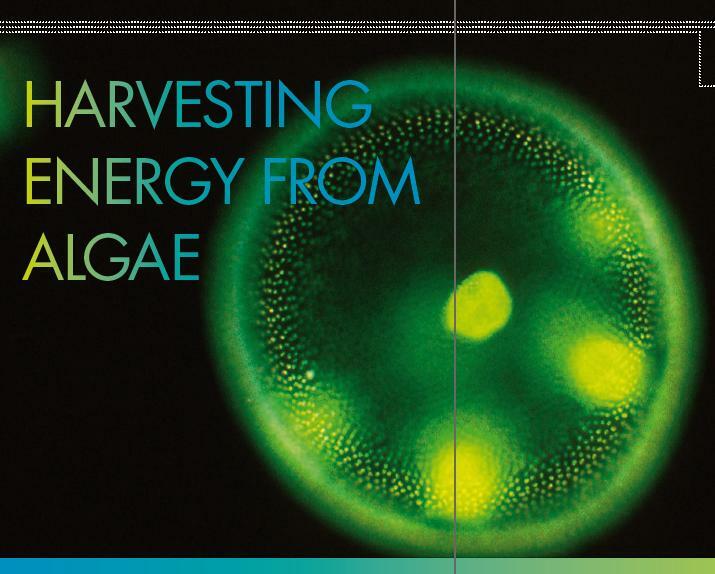 Algae consumes carbon dioxide, thus reducing harmful greenhouse gases. 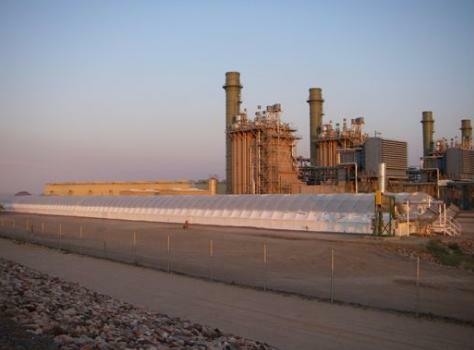 Most algae farms are being built right next to coal fired electricity plants so they have a steady supply of CO2. I don't know much about it, but those "carbon credits" are very valuable. Total estimated carbon credit trading this year is about $72 billion dollars. And is expected to reach $32 Trillion by 2020. The byproduct left over after extracting the oil can be used in cattle feed, vitamins, pigments, cosmetics, etc. 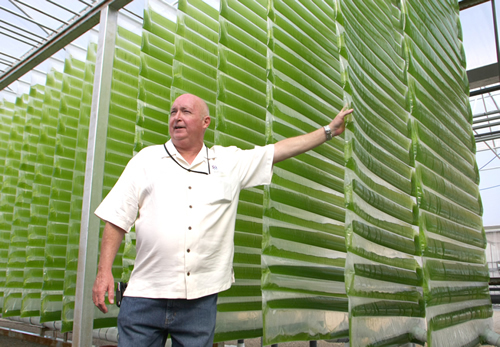 Algae can also be used to clean up waste water. I'm sure you have all heard of the blue green algae vitamin supplements. 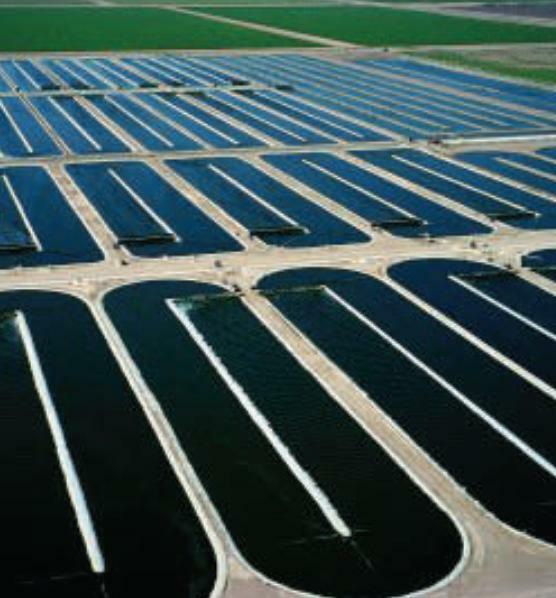 This business sector has been cultivating algae for many years now in huge quantities. So this technology is not exactly new. From Wikipedia - "Anastasios Melis a researcher at the University of California at Berkeley discovered that if the algae culture medium is deprived of sulfur it will switch from the production of oxygen (normal photosynthesis), to the production of hydrogen. He found that the enzyme responsible for this reaction is hydrogenase, but that the hydrogenase lost this function in the presence of oxygen. Melis found that depleting the amount of sulfur available to the algae interrupted its internal oxygen flow, allowing the hydrogenase an environment in which it can react, causing the algae to produce hydrogen." If algae biodiesel farms could also produce valuable hydrogen, this sure would make the economics of the algae farms more feasible. The hydrogen could be used to power the new fuel cell cars or cars that burn hydrogen directly in an internal combustion engine. Right now, most hydrogen is produced using expensive electrolysis. Ethanol - As you all are painfully aware of, producing ethanol has it's drawbacks. The price of crops has risen drastically over the past year. The ethanol people say it should not be so because the byproduct of ethanol is a high protein animal feedcake. They say no animal feed is lost in the process and the price of corn should not go up because of that. All I know is that everything is more expensive and that's a fact. It's probably due to the fact that more oil crops/animal feed crops are being planted than people food crops. Oil Crops - Here too, prices are skyrocketing and probably for the same reason... more crops are being planted for biodiesel than for human consumption. The biggest problem with oil crops is that there is only so much land out there and in today's environment, we can not replace food crops with oil crops. That's why I like Jatropha so much... it can be grown where food crops will not grow. The same can be said for algae biodiesel - it can be produced without using up valuable food crop land. Another problem with jatropha has been the cutting down of irreplaceable rain forests to plant jatropha. This just needs to be stopped. Can high oil prices be a good thing? I know all of you are feeling the pinch at the gas pump, but there are good things happening because of the high price of oil. I know John McCain is not president yet, but he is proposing a $300 million dollar prize for a better battery for electric vehicles. Now that's taking some serious action! And it would never have happened in a million years unless we were backed up against a wall due to high oil prices. The high prices have put our country in a desperate situation. And when people get desperate, things happen. Look for a lot more alternative energy options to appear in the near future. That's a good thing! Another cool thing that is starting to happen is those overseas manufacturing jobs are returning to America! It is actually becomming cheaper to manufacture things here in the good old USA rather than manufacture them in China and ship them half way around the world to the US. If that trend keeps up, it could be such a big boost to our economy that people will start to love the high price of gas! Biodiesel is produced abroad using foreign grown oil crops and shipped to the United States, where it's blended with just a "splash" of regular diesel. A typical tanker-load of about 9 million gallons of biodiesel requires just 9,000 gallons of American diesel to make it qualify for the subsidy. The ship then makes a "dash" for Europe, where its fuel is sold below market rates; that means each tanker-load that makes the dash nets importers about $9 million dollars in tax credits from the IRS. In 2007 this subsidy cost the American taxpayers $300 million; it's projected to cost them $600 million next year. 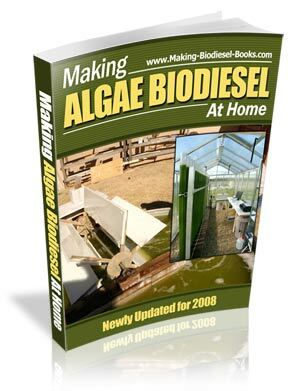 Did you know you can start an algae biodiesel farm in your own back yard? There are many different strains of algae that you can use. The book tells you all about them and even where to buy them. You can cultivate aglae in salt water and fresh water. You can grow algae in cold weather and hot weather. You may not even need to buy algae strains - you probably have them already in your area. 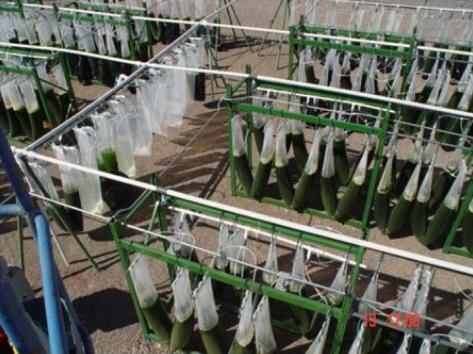 Algae complete an entire growing cycle every few days compared to most of a year for most crops. One quad (7.5 billion gal.) of biodiesel could be produced on 500,000 acres. To produce one quad from a rapeseed crop would require 58 million acres. There's much, much more info in the Book, so just click on the book cover below to read all the fine details and get your downloadable copy today! WARNING: There have been a lot of "scam" sites lately selling those run your car on water devices. These devices DO NOT work. Save your money and DO NOT buy them under any circumstances! For more information, see my Dennis Lee scam newsletter.